Documentation of Ryu Hankil's performance Description for Other Things at 221A on September 7, 2012 as part of Translation Services. Image Credit: Oliver Li. Translation Services is a three-part exhibition curated by Hyung-Min Yoon that brings together artists Ryu Hankil (Korea), Jarrod Sanderson (UK), Andrea Francke (UK) and Jackson Lam (UK) to explore and expose the ways in which translation modifies meaning, privileging or suppressing forms of knowledge. Translation, derivative of the Latin word translatio meaning ‘to carry across’, implies a bridge or journey. The etymology of this word reveals the potential for something to slip or drop along the way – an imperfect path from source to target. Therefore, translation has always been a daunting task that paradoxically aids communication but inevitably obscures meaning. Through text, video and sound, Translation Services engages with the inadequacy of translation and its subsequent implications within Vancouver’s culturally diverse context. 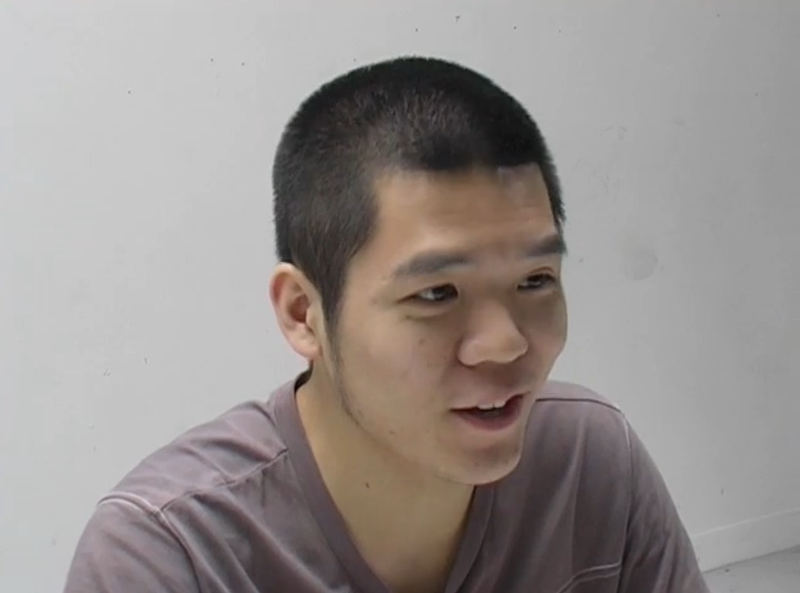 Ryu Hankil, artist and musician, founded The Manual Publishing, an organization that hosts improvisational sound performance and experimental collaborative projects. 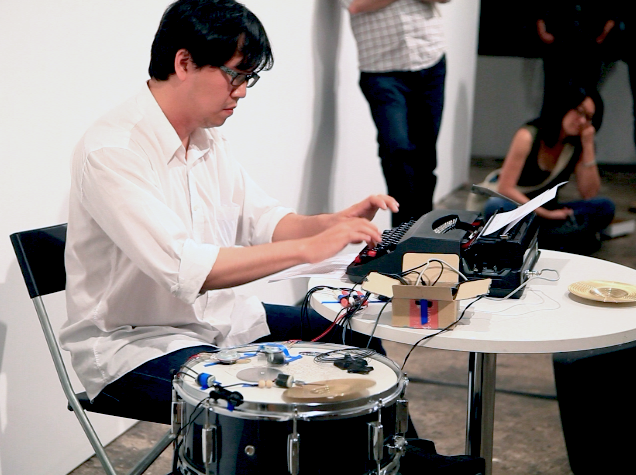 In his recent performance Description for other things, Ryu brings out a typewriter as his instrument. While he is typing, the motor hits various objects he set up on the stage that creates sound. Ryu intends to design the sound through sending out his writing. This reverse process of transcription inexplicably exposes the frustration of communication and the absurdity of translation. 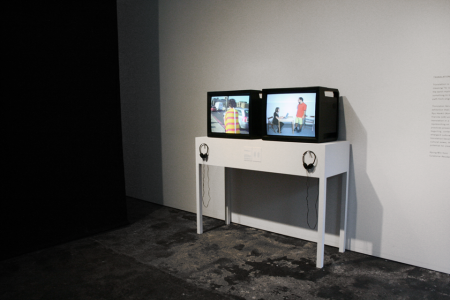 Ryu will also create a site-specific sound installation with found objects and field recordings from in and around 221A. Part 2: Sept 28 – Oct 13, Jarrod Sanderson, What difference between me and you? Sanderson’s video What difference between me and you? focuses on how language, ostensibly a medium for communication, can also be a site of power, miscommunication and repression. Motivated by his background in anthropology, Sanderson filmed interviews with art students in London for whom English was not their first language. While interviewees talk about their artistic ambitions, Sanderson’s voice repeatedly corrects their grammatical mistakes in English instead of concentrating on the content of their dialogue. 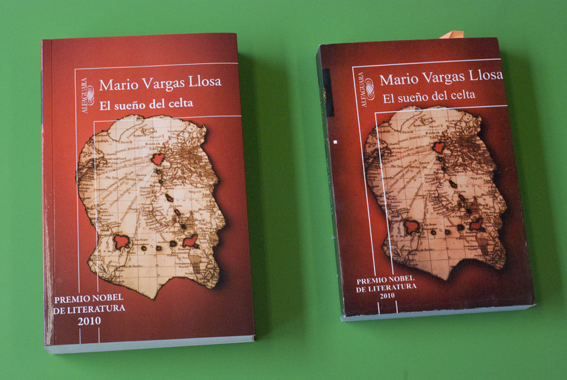 Please Translate explores how book piracy has been used as a tool for political expression and freedom of speech. 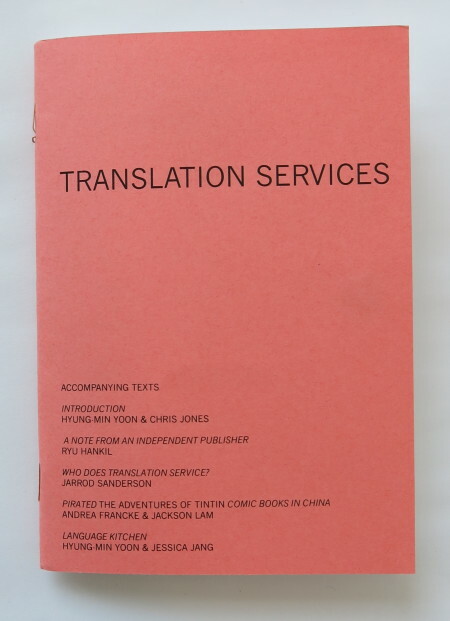 It focuses on copyright issues in relation to the circulation of unauthorized translations. The project aims to give a historical context of the practice and also provides a working space for the development of new pirate translations. The project is developed by Andrea Francke and Jackson Lam. As part of Institutions by Artists, Francke will speak about The Piracy Project, an international publishing and exhibition project in partnership with AND Publishing. Installation photograph of Je t’inventerai des mots insensés que tu comprendras (2012) by Jarrod Sanderson. Image Credit: Jay Yoon. Image still from What Difference Between Me and You? by Jarrod Sanderson, courtesy of the artist. A collection of pirated books and printed ephemera on display for one night.